Titles added to our database of forthcoming releases, Incoming, this week include the award-winning mini-series Masada, which starred Peter O'Toole and Anthony Quayle; Rob Reiner's comedy The Bucket List (on DVD and Blu-ray); the next feature-length adventure for Leela, Fry, Bender and the rest of the Planet Express team, Futurama - The Beast With A Billion Backs; the sixth series of BBC sitcom It Ain't Half Hot Mum; acclaimed drama The Savages; and the recent tongue-in-cheek British horror movie The Cottage. I've also added details of an array of forthcoming releases from Tartan: A Bittersweet Life - Collector's Edition, I'm A Cyborg (on DVD and Blu-ray); The Uninvited; Princess Aurora; the Ghost School Horror box set; the Fukasaku Trilogy box set (three films from the director of Battle Royale: Blackmail is My Life, Black Rose Mansion and If You Were Young) ; and their Paul Verhoeven Collection box set (which contains pre-Hollywood movies Business is Business, Turkish Delight, Katie Tippel, Soldier of Orange and The Fourth Man). Recent Blu-ray additions include Optimum's box set of the four Rambo movies, The Ultimate Rambo Collection, sadly, it seems, missing the commentary tracks that accompany the first three films in the US Blu-ray set, from Lionsgate. Potential customers of Abbey Kids' new The Wombles - Complete Collection DVD should be aware that there appear to be authoring problems with the disc. The menus are a complete mess - selecting any of the first twenty-five episodes will play a completely different episode. One episode, A Sticky End, appears to be missing, and another, Madame Cholet Returns, is apparently on the disc twice (it appears when you select episode nine, The Invisible Womble, or, correctly, when you select episode sixteen). 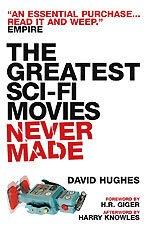 Titan Books will release a revised and expanded edition of David Hughes' book The Greatest Sci-Fi Movies Never Made on July the 25th. The 320-page book will include information about legendary unmade films like Spielberg's Night Skies, Philip Kaufman's Star Trek - Planet of the Titans, Tim Burton's Superman Lives and James Cameron's Alien 5. Intrigued? The book also examines what Watchmen might have been like if it had been directed by Terry Gilliam, or what Spider-Man might have turned out if James Cameron had been at the helm. The book has a foreword by visionary artist H.R.Giger. and an afterword by Ain't It Cool News' Harry Knowles. RRP for the book is £9.99. Amazon have it available for pre-order for £6.59 (+ P&P). Play.com are offering it for £7.49. Fantom Films are organising a celebration of the fortieth anniversary of the Patrick Troughton Doctor Who story Fury From The Deep, which will be held in the Tabard Theatre, Chiswick (west London), on the 8th of June. Guests at the Fury at Forty event will include actors Deborah Watling (who played the Doctor's companion, Victoria), June Murphy, Brian Cullinsford, Roy Spencer; writer Victor Pemberton; Assistant Floor Manager Margot Hayhoe; and visual effects designer Peter Day. Full details can be found at the Fantom Films website.